One possible reading of this anomalous sheet of white in Blue Marrow is that it is indicative of the silence that threatens the text throughout. This is a poem about the violence committed against Indigenous peoples in Canada during colonization, a topic which has been historically repressed and continues to be actively denied. According to Elizabeth Cook-Lynn, “new nations are born from the spilling of blood of other nations a fact that must be denied if a nation is to see itself as ethical.” See for instance, Stephen Harper’s insistence at the G20 that Canada “has no history of colonialism”. Halfe contends with the weight of this denial throughout her work. It weighs on her words and threatens the clarity of thoughts. Elsewhere in Blue Marrow she writes, “this chosen walk is a blizzard whiteout / My Creeing alone in the heavy arm of snow” (15). For the narrator (also a poet), the “chosen walk” being described here represents the path that she has taken up as a conduit of Indigenous history and colonial violence. The blizzard whiteout thus becomes a symbol of the oppressive white culture that works to isolate, dampen and even smoother Indigenous voice as it attempts to render appreciable a call for justice . In this sense, the white page can be read as a textual manifestation of that “whiteout,” a formal interruption of the Cree-ing Halfe herself is doing in the literary canon. Ran without a tongue (13). As Halfe describes in the footnote that accompanied the original publication of this poem, pâhkahkos, “is a paradox. She forces us to look within and confront and resolve our skeletons, the past that burdens and hardens our lives. To ignore her appearance is to run from our own frightful personal lives.” In the passage quoted above, Halfe’s narrator testifies to the silence that pâhkahkos carries with her: a testament to trauma, she is hidden, obscured, but that does not mean her presence is not felt. And while confronting one’s skeletons is, as Halfe articulates, part of the process of healing, finding the strength and the language to actualize that confrontation, is often beyond the survivor’s capacity. Indeed, upon encountering the figure here, the narrator “[runs] without a tongue”—stripped of voice, although even more acutely aware of the need to evoke the past. In this sense, pâhkahkos, as paradox, becomes a means of articulating the silence around which the language and poetics of Halfe’s narrators circulate. Or, to put it differently, pâhkahkos traces that which refuses representation, but which simultaneously demands to be articulated. True to her nature, pâhkahkos, both literally and figuratively, thus finds her way into nearly all of Halfe’s work: “none/ escape[…] pâhkahkos,” she writes in The Crooked Good—her voice, her paradox—forms a centre from which the narrators and characters of these poems must locate themselves. 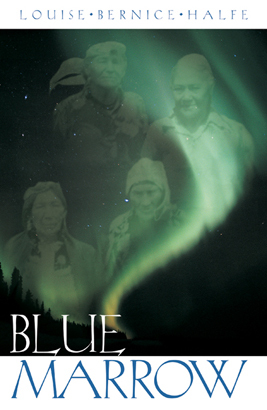 According to Quill and Quire, Blue Marrow is an “impassioned critique of the historical and contemporary sufferings Aboriginal people have endured.” The long poem has been labelled a “quest for voice” by Laura Ann Cramner, and Warren Cariou identifies it as a type of ritual, a call to justice and redress with emphasis “on the necessity of present action”. As Cook-Lynn illustrates, historically, however, particularly in colonial states that want to project themselves as benign, friendly entities, stories that bring to light the trauma and bloodshed of colonization are quickly quashed, or given limited space to be heard. Thus, while Blue Marrow works to enter stories of historical violence against Indigenous people into the public discourse, illustrating, sometimes in graphic detail, the ways in which her ancestors were poisoned, raped and murdered in the name of colonialism, testifying to this history is a difficult and laborious task. Indeed, at points the narrator admits that the words “hardly get passed my throat” (15) and those voices she draws on must speak through “blistered tongues” (18). As such, the blank page in Blue Marrow can be read as a representation of the colonial silence that threatens the text throughout—and is only kept at bay by the persistence and strength of its narrators. It is a moment, if only a brief one, in which the pressure of silence is too much even for the strongest speaker and it slips in between the covers of the text to make itself purposefully felt, before, of course, being beaten back to once again crouch in waiting at its corners. The fact that the blank page finds its way into the second edition and not the first draws is indicative of the similar ways in which silence continues to bleed into Halfe’s work as a poet, despite her best efforts to keep it at bay. Contrary to a progressivist, “post-racial” interpretation of history, in which liberal society is gradually correcting the wrongs of history and coming towards a general acceptance and understanding of one another, the white page in this text gestures towards the silence that continues to impinge on the narratives that expose the violence of colonial history–even after they have been registered as part of the national fabric. It is a performative moment. A small instance when the text is able to embody the silence it works against. Reading the white page as a part of Halfe’s narrative, rather than disregarding it as a publishing error, is thus an acknowlegement of the intensity of the colonial project that the poet is working against. It is a moment to consider all of the silence, and all of the blank pages that settler colonialism has imprinted on our history.